This small ancient town is a convenient tourist centre, lying midway between Carmarthen and Llandovery, bypassed by the A40 which follows the route of the meandering Tywi River with its castles and oxbow lakes. It is a short drive to the western edge of the superb Brecon Beacons National Park with the glorious upland landscapes of the Carmarthenshire Fans and Black Mountain. The name divides into two parts: Llan, meaning monastery or church and Teilo, the name of a saint who was a contemporary of St David, the Patron Saint of Wales. The town itself has a number of small shops, some of them high class boutiques and jewellers. There is the large Cawdor hotel, The White Horse and Angel pub/restaurant as well as a bistro and cafés. A Country Market is held in the Civic Hall on Friday mornings until 12:30pm. In mid-July, the town hosts a popular Annual Festival of Music where you can hear performances by a variety of well-known classical musicians. Some of the coffee-time and lunchtime events are free of charge and there are evening concerts and recitals throughout the week including choral works, chamber orchestras, operatic solos, string quartets and an evening of jazz. This ruined medieval Welsh castle stands upon a high ridge above the meandering River Towy. Its ancient parkland is home to some ancient and famous oak trees as well as deer and white cattle, and the adjacent 17th Century Newton House also makes for an interesting visit. Managed by the National Trust, its history is presented in a child-friendly format and it has a tearoom overlooking the deer park. A wooded boardwalk, particularly suitable for families and wheelchair users, gives access to the castle. Since 2012, a literature festival has been held here for 3 days in late June and has enjoyed great success. There are events for all the family. Castle Woods Nature Reserve is an area of around 25 hectares surrounding the castle and which contains a large variety of deciduous trees as well as floodplain grassland where lots of exciting water fowl can be seen. Only fragments remain of this castle, but it was central to the security of the kingdom along with Dinefwr during the reign of the princes of Deheubarth. You might not want to take small children to the castles as there are steep spiral staircases and vertiginous drops from the battlements! At the head of the Talley lakes, embellished with reeds and water lilies, stand the ruins of Talley Abbey. Like so many monasteries, it was established in a place of beauty and serenity: qualities which seems to be most intense at the end of a sunny day. 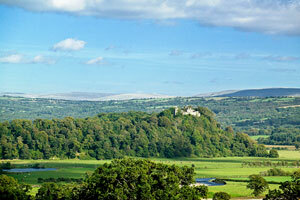 Gelli Aur is a 60-acre Country Park surrounding a magnificent mansion. Some walks are open but the house and deer park there are currently closed (Oct 2014). Also see our Carmarthenshire Heart page for a summary of Llyn Llech Owain Country Park which is nearer to Cross Hands. Due to the intervention of a wealthy American benefactor in 1995, the crumbling house at Aberglasney has been transformed, and from a wilderness overgrown with invasive weeds, the garden has been painstakingly restored and is on course to become one of the finest in the UK. Its 10 acres are made up of three walled gardens and an Elizabethan/Jacobean cloister and parapet walk. The most recent addition is the award winning ‘Ninfarium’ - a unique indoor garden filled with a wide variety of exotic plants. 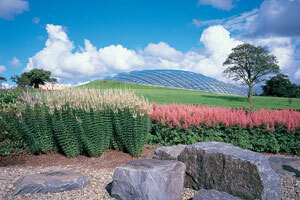 Also nearby is The National Botanic Garden of Wales at Llanarthne. It is both a visitor attraction and a centre for research and conservation. The Great Glasshouse, said to be the world's largest single-span glasshouse, has exotic plants from six areas of the world. Just to the north of Llandeilo is a small village called Bethlehem. Visitors love to post their cards from the post office there, keeping staff extra busy! Have a day out on the Heart of Wales Railway Line. If you just fancy a quick trip, take the train to Llandovery and back or perhaps nip down to Swansea for the day – it only takes an hour each way from Llandeilo. Sample the great menu at Y Polyn Restaurant. 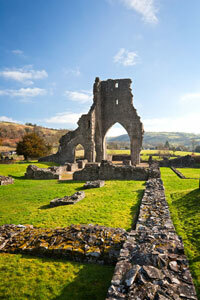 See more things to do in the heart of Carmarthenshire. 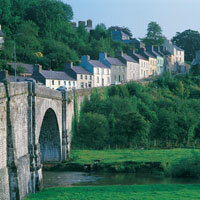 Looking for somewhere to stay in the Llandeilo area?